Performers include: Mary McCormack, Michael Hayden, J.C. MacKenzie, Barbara Bosson, John Fleck, Markus Redmond, Daniel Benzali, Jason Gedrick, Stanley Tucci, Linda Carlson, Grace Phillips, Patricia Clarkson, Vanessa Williams, Anthony LaPaglia, Dylan Baker, D.B. Woodside, Gregory Itzin, Joe Spano, John Pleshette, Bobbie Phillips, Ned Vaughn, Paul Goodman, Jack Kehler, June Saruwatari, Alexia Robinson, Rosanna Huffman, David Fresco, Pauley Perrette, Toni DeRose, Clayton Rohner, Vanessa Zima, Rick Worthy, Don McManus, Stanley Kamel and Ralph Waite. This legal drama follows the cases of the attorneys at the prestigious Los Angeles law firm of Hoffman & Associates. Theodore “Ted” Hoffman is a defense attorney and the head of the firm. As the series begins, he has just cleared his client, billionaire Richard Cross (Stanley Tucci), of the murder of 15-year-old Jessica Costello (Collette White) who was found strangled to death in her bedroom. Ted then signs on to represent movie actor Neil Avedon (Jason Gedrick), Jessica’s boyfriend. Neil’s a frequent drug and alcohol user who has now been arrested and charged with Jessica’s murder. The first season follows Avedon’s trial as Ted works to save his client by providing other theories for Jessica’s murder, one of which involves Gary Blondo (John Pleshette), the producer from Avedon’s latest flick. Working against Ted is the prosecution team of Miriam Grasso (Barbara Bosson) and Mark Washington (Markus Redmond), as well as Detective Arthur Polson (Dylan Baker) and District Attorney Robert Garfield (Gregory Itzin). The case garners a lot of press and Ted’s wife, Annie (Patricia Clarkson), tries to prevent their daughter Elizabeth (Vanessa Zima) from the public scrutiny. 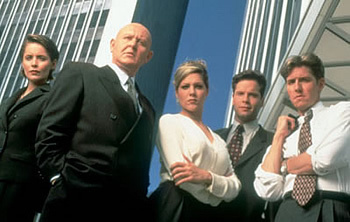 Also taking on cases at the firm are ambitious Justine Appleton (Mary McCormack); second chair during the Avedon trial, Chris Doknovitch (Michael Hayden); intelligent but socially awkward Arnold Spivak (J.C. Mackenzie); and Ted’s second chair during the Richard Cross trial, Lisa Gillsepie. Louis Hines (John Fleck) keeps Ted’s schedule as his assistant and Lila (Vanessa Williams) is the firm’s receptionist. When the firm’s private investigator, Dave Blalock (Kevin Tighe), is murdered following up on a lead for the Avedon trial, Ray Velacek (Joe Spano) is hired to replace him. After the trial, Ted leaves Hoffman & Associates to re-establish his relationship as a father and husband. Former assistant district attorney Jimmy Wyler (Anthony LaPaglia) takes over the firm in his absence. I totally agree with Chip Ramsey. Season two was so far from season one it caused the demise of this excellent post OJ trial show. The Daniel Benzali character Ted Hoffman was what made the show eagerly anticipated. I have to wonder what imbecile made the decision to annhilate the best legal show TV ever produced by inventing season 2. The first season, this show was the BEST PROCEDURAL EVER. Seriously. Daniel Benzali was absolutely riveting.